Tracking the pricing of inventory is another vital aspect of running a business. A product price list template helps keep track of the cost and pricing of inventory items. There is a difference between what a retailer pays and what they charge for merchandise. This is the profit that sustains your business funds. It also shows the profit margin of the merchandise that you have for sale in your business. Navigate to the download link on our site. Save it to your desktop, or somewhere you will remember. This product price list template has space for your actual cost of the product and your selling price. This lets you see at a glance how much profit you are making from your products. It also gives you the tools you need to decide if product prices need to be increased or decreased. Get a real look at your Return on Investment (ROI) of the products your business sells with this template. Record the item, the item wholesale dealer price, and record how much the retail price of each item that you purchase to sell. A product price list template helps a business see where profit and cash flow is coming from and where it could be increased. For example if a shop purchases a lot of sunglasses for one dollar each and retail pricing is 10.00, your company is making about a 500% profit. The profit margin is easily seen with a pricing template. Inventory management is a vital part of any retail or wholesale business. As a business, it is important to keep track of all inventory and cost vs. pricing information. Business runs better when the business owner can see at a glance where their profit and loss is coming from. 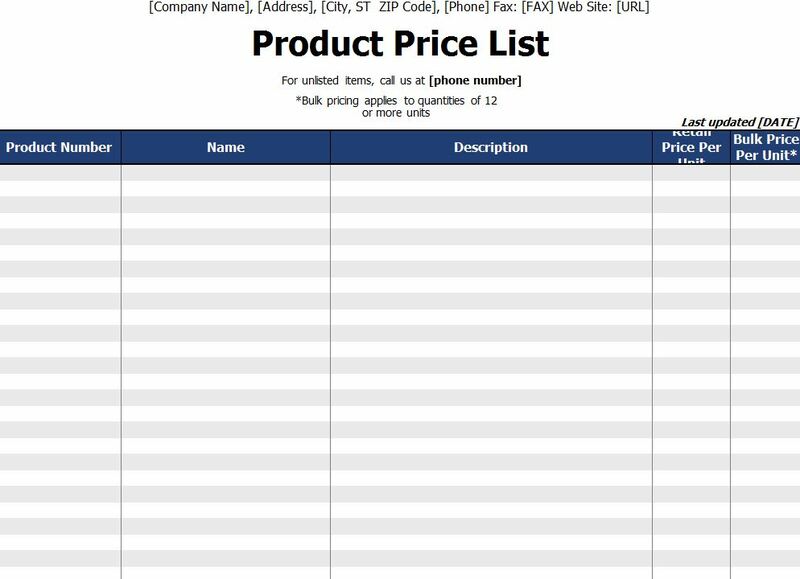 Figuring product retail pricing is simple with a product price list template. Download yours today and see where your income is really coming from.